What is Pour-Over Drip Coffee? The Frankfurt tremendously simplifies making Pour-over coffee. Just add your freshly ground coffee to the stainless steel filter sitting on top, slowly pour hot water over the coffee in a circular motion, and watch as your flavorful coffee drips into the server sitting below. To avoid clogging the filter, wash with a soft sponge after each use. Please contact Rizpresso through Amazon email for ANY questions or concerns. You can also contact the Manufacturer directly or visit their website for any quality or coffee making questions. WARRANTY - Please contact Rizpresso through Amazon email for ANY questions or concerns. You can also contact the Manufacturer directly or visit their website for any quality or coffee making questions. 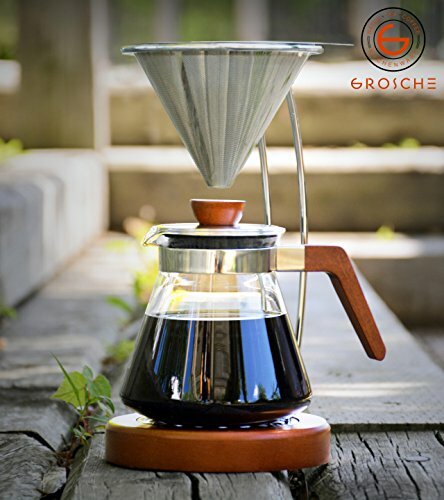 If you have any questions about this product by GROSCHE, contact us by completing and submitting the form below. If you are looking for a specif part number, please include it with your message.